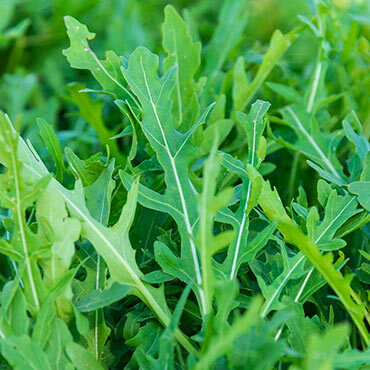 Grazia Arugula | Gardens Alive! Grazia packs a punch of spicy, bold arugula flavor. Its uniform plants produce deeply serrated, dark green leaves, and are slow to bolt. That is, they won't produce premature flowering shoots that take vital nutrients away from the arugula leaves. This improved wild arugula has an extremely long shelf life after harvest. Plus, Grazia attracts beneficial bees and other pollinators to your yard, since they love its dainty, yellow blooms that float above the plant when left to flower. Harvest often, as you can get several fresh cuttings per season, even when grown in a small container. 50 days to maturity. Zone: 3 - 9 (Annual ).